It’s Monday, and if you’re like me, you’re longing for another carefree, laze-about Sunday. Well, I can’t change the day of the week, but I hope these Sunday Shoes selections will help your feet feel relaxed no matter what day it is. These are comfy, cute, eye-catching shoes that will attract the attention of that cute guy or gal you’ve been scoping out at the farmer’s market. Then, they each designed their own sweet sassy sneaker for DC. These are so hip, they have their own promotional rock video. Check it out here. Tegan’s shoe features an abstract, punky wave. 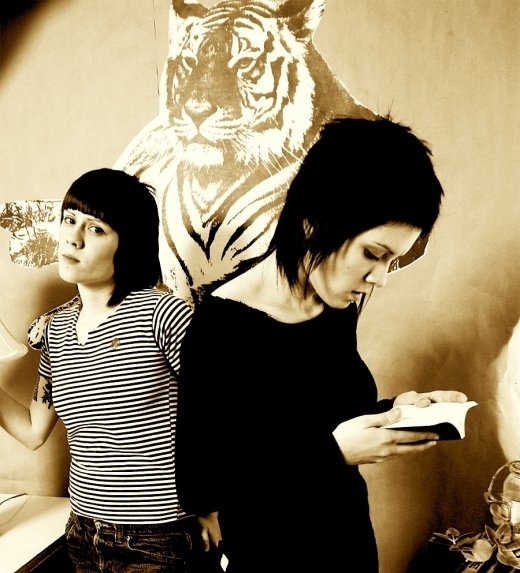 I’m not sure how Tegan made water look punky, but there it is. It also reminds me of a proud eagle. Sara’s shoe has a bold design featuring her first initial. The inside of these hightops is a completely unexpected purple color. I wish I had both pairs– they look so beautiful together, I might just wear one of each! This entry was posted on Monday, January 26th, 2009 at 11:15 am	and is filed under Celebrities, Main. You can follow any responses to this entry through the RSS 2.0 feed. You can leave a response, or trackback from your own site.